Employees’ Provident Fund (EPF) subscribers can request a change in their basic details online, through the EPFO’s (Employees’ Provident Fund Organisation) Unified Portal – unifiedportal-emp.epfindia.gov.in. This was said by retirement fund body EPFO on microblogging site Twitter. Retirement fund body EPFO provides an online facility that enables EPF members to request a correction or update in their basic details online. This online facility works on an Aadhaar verification-based method, wherein the requested changes are compared with the details in the Aadhaar database, maintained by the Aadhaar card-issuing authority, the UIDAI (Unique Identification Authority of India). At that time, an EPF subscriber looking to correct the basic details fed into his or her UAN had to submit a joint request, along with the employer, to the concerned EPFO Field Office. The online facility is aimed at reducing “the paperwork and time delay” in the existing process, according to the EPFO. Under the online process, the request is submitted online by the EPF member. The employer is then required to forward the online request to the concerned EPFO office. 1: The member logs in through his or her UAN and password on the Member Interface of the Unified Portal. A link to this portal is given here. 2. 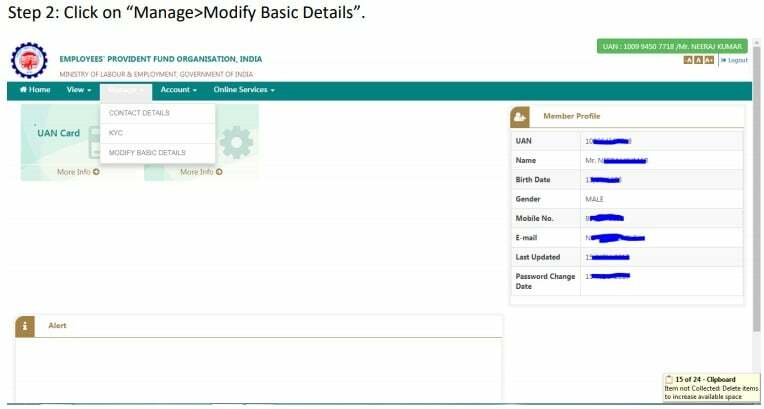 The member can then proceed by clicking on ‘Modify Basic Details’ under the Manage section. 3. 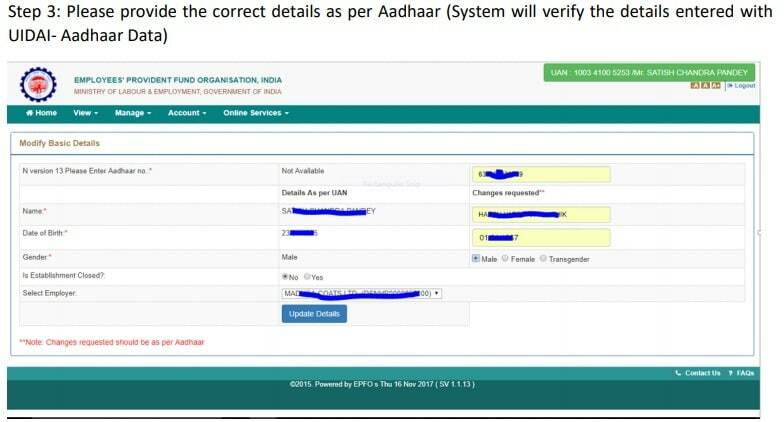 After this, the user is required to enter the correct details as per his or her Aadhaar. The system uses these details to verify those in the UIDAI-Aadhaar data. 4. Once the user clicks on ‘Update Details’ on the previous screen, a request is submitted to employer for further approval. Before submission by the employer, the employee can withdraw the request by clicking on the ‘Delete Request’ button. 5. After this stage, the employer will log in to Employer Interface of Unified Portal. Here’s a link to this portal, meant for employers. 6. The employer can then view the change requests submitted by the employee by clicking on ‘Details Change Request’ under the ‘Member’ section. 7. The employer can view the online requests received from employees and can thus take appropriate action by giving remarks. 8. After approval of request, the employer can see the latest status of request. 9. 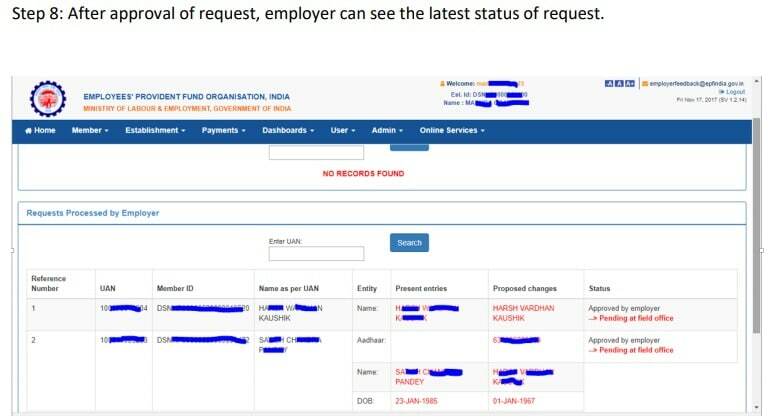 After approval of request by the employer, the request will appear as a task in the login of Dealing Hand (concerned person of the EPFO office) in the Field Office Interface of Unified Portal. 10. The Dealing Hand can login and view the online change requests by clicking on ‘Details Change Request’ under the ‘Member’ section. 11: After due verification, the Dealing Hand can submit his or her recommendations to Section Supervisor. “The Dealing Assistant can put the case either for Approval or Rejection by selecting the appropriate radio button i.e. Recommended for Approval or Recommended for Rejection with proper remarks. In the same manner Section Supervisor can submit his/her recommendations to APFC/RPFC,” according to the EPFO.